This was my first ever kill with a bow. Last year I took my girlfriend for her first hunt and mid morning a monster came out at forty five yards, caughtwind of us and walked broadside along the hedge row. I could shoot that far while practicing, but I made a very ethical decision and didn't shoot. I vowed that would never happen again so i went out and bought a top of the line Hoyt Rampage XT. This year around same time I took my girlfriend with me once again. Ten minutes after sunrise I grunted. In the distance you could hear crashing and grunting coming our way. My girlfriend, Lauren, started to shake me cause she saw him first. I grunted once more and he came running on a dead sprint towards us. He quartered to me at 25 yards and I had to take a shot. Hit him square on mid chest. A half hour later I went to see my arrow and you could tell it was a clean shot. I called my family and we grouped for the track. My girlfriend took the lead cause she could see best and we were off. After a half mile the trail stopped and we lost it. We ran into some family friends in the woods walking their dog and they said they would keep an eye out for us. We went home very dissappointed. We recieved a call 11 hrs after the shot saying they found our deer. I got dressed and took off. They said they never went where they did, but saw a beaver dam and wanted to check it out . No dam, but there lied my deer. 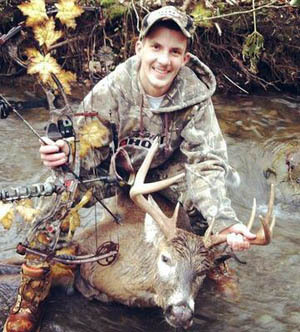 The beautiful 9-point whitetail was shot in Onondaga County on 11/11/2012 it scored 111 and was found 11 hours later. It dressed out at 180.